Product prices and availability are accurate as of 2019-04-19 04:19:05 UTC and are subject to change. Any price and availability information displayed on http://www.amazon.com/ at the time of purchase will apply to the purchase of this product. Deccobond Wood Flooring Repair Adhesive is used to repair: hollow spots, squeaks, end-lifting, delamination, voids, etc. for engineered hardwood floors. These floor defects are caused by adhesives fail to perform, sub-floor not level, installation defects, wood floor quality creeping due to radiant heat cycling over time. 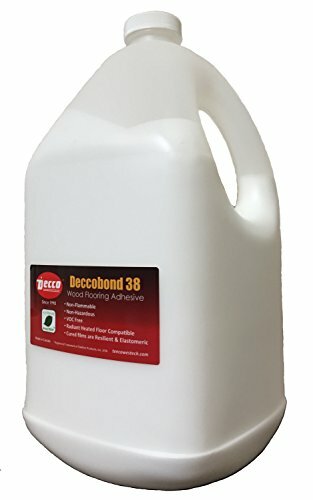 Deccobond 38 Wood Flooring Repair Adhesive is made in Canada, proprietary formulated, flows & fills voids easily, solvent free, VOC free, eco-friendly, non-flammable, non-crystallizing, resilient after cured and remains elastomeric through out the life of the floor. It's compatible with wood, concrete, & radiant heated sub-floors. For flooring professionals & DIY. Repaired wood floors feel SOLID! Use together with Deccobond Wood Flooring Repair Kit, FIX-IT, Drill & Fill Deccobond 38 Wood Flooring Repair Adhesive is used to repair: hollow spots, squeaks, end-lifting, delamination, etc. for engineered hardwood floors Deccobond 38 Wood Flooring Repair Adhesive is proprietary formulated, solvent free, VOC free, eco-friendly, non-flammable, flows & fills voids easily, resilient after cured and remains elastomeric through out the life of the floor, radiant heated floors compatible. Made in Canada. 5-Easy steps to repair for flooring professionals & DIY. Huge cost saving! No need to remove & replace loose & hollow floors Repaired wood floors feel SOLID! No more: "bouncy", "springy", "creaking", "spongy", "popping", "delam" floors!